Knowing how to balance your checkbook, understand the ins and outs of credit, and read a drug facts labels are all vital skill that are not necessarily taught in school. With the importance of developing these, and other critical skills in mind, close to one hundred students from high schools all across the District of Columbia, Virginia, Maryland and Pennsylvania gathered on January 27, 2012 at the American Farm Bureau’s beautiful offices for the first ever DC LifeSmarts Training Camp. The Training Camp, sponsored by the National Consumers League, the University of the District of Columbia’s Extension Service and the American Farm Bureau, was designed to introduce new students to LifeSmarts content through games, activities and competition, and inspire enthusiasm for learning important consumer literacy skills through teamwork and fun. The day began by offering a brief overview of the program and challenging all students to compete for a coveted spot at the 2012 National LifeSmarts Championship in Philadelphia from April 21-24. [caption id="attachment_2337" align="alignleft" width="210" caption="Students work on their consumer skills "mind maps""] [/caption] The first activity of the day had participants working in their teams to create “visual mind maps” that illustrated what they thought they would need to know for life after high school. 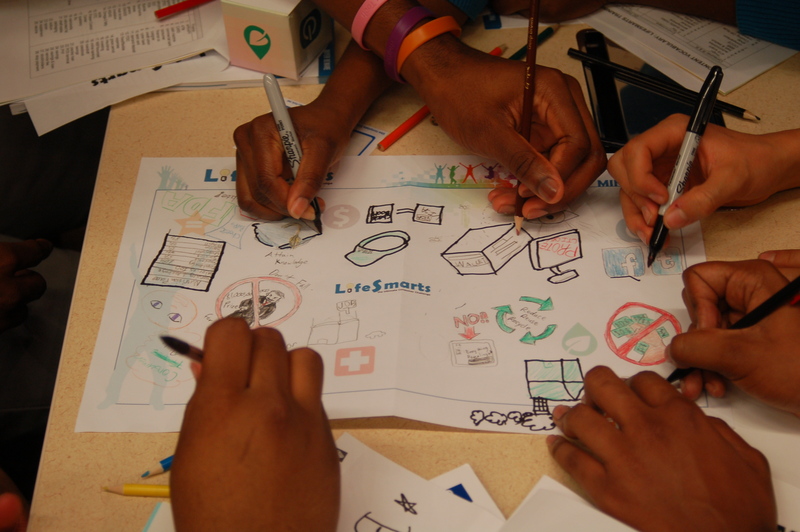 Students put their creativity and artistic talents to the test in thinking about how mastering the five LifeSmarts topics of personal finance, health & safety, consumer rights & responsibilities, technology, and the environment, would serve them after graduation. Smart money management emerged as one of the room’s top concerns. The next several activities introduced students to vocabulary that included topics ranging from online privacy, web “cookies”, interpreting labels on OTC medicines and navigating through the Federal Consumer Information Center’s Consumer Action Handbook. Students were sorted into teams to answer challenging multiple-choice questions using audience response system technology. Before anyone could get too comfortable, it was time to compete in LifeSmarts, the ultimate consumer challenge! Two 2011 LifeSmarts state champion teams were on hand to demonstrate how the game was played. A few new students exchanged worried glances as the teams from Maryland and Virginia breezed through questions about taxation, the role of federal agencies, and safely handling muscle injuries, but when it came time for new students to hit the competition circuit, they were lighting up the buzzers like pros! [caption id="attachment_2341" align="alignright" width="240" caption="Competitions begin!"] [/caption] By the end of the day, every student left with a solid grasp of the program, including the competition format and the breadth of program content. LifeSmarts program staff has a sneaking suspicion that competition to win the title of District of Columbia LifeSmarts Champion will be tough this year!